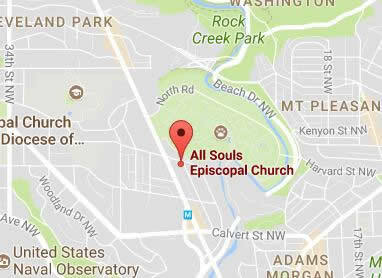 All Souls Church is just off Connecticut Avenue, NW, on the corner of Cathedral Avenue, NW and Woodley Place. Take the RED line to the WoodleyPark station. Walk North on Connecticut Avenue (up the hill) two blocks to Cathedral Avenue. Turn right on Cathedral and the church is located on the right, on the corner of Woodley Place. There is a small parking lot at the rear of the church, which may be entered from Woodley Place by a driveway just beyond the Sunday School Annex at the rear of the church. Parking is also allowed on the right curb lane of Cathedral Avenue and the left curb lane of Woodley Place on Sundays from 8:30 a.m. until 1:00 p.m. Note: From Monday through Friday, 8 a.m. to 9:30 a.m., no right turns are allowed off of Cathedral Avenue onto Woodley Place, but left turns are allowed if you're going the other direction on Cathedral Avenue (up the hill towards Connecticut Avenue). 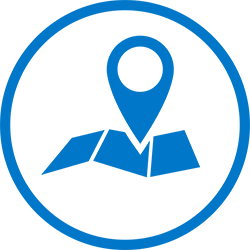 Click the image above for directions & parking information. Click here to subscribe to our email list for weekly announcements and important updates, such as closures for inclement weather. Find AllSoulsDC on Facebook and Instagram.